I missed the memo about ditching cable TV. Let’s get something quite clear from the outset. I love TV. I am kind of a couch potato, and for better or worse, my son is kind of a couch tater tot. Sure, we go outside and play, but on the evenings that we’re home, we’re often watching TV. I make no apologies for this. However, in keeping with the zeitgeist, my husband and I have been feeling the need to streamline things a bit. Figuring out how to spend less money and simplify your life seems like a rational response to budgetary restraints and burgeoning chaos, right? Right. But give up our cable? Should we? Could we? Yes we can. We ditched our cable a couple of weeks ago and there’s been no looking back. We have not, however, given up watching TV. We got a miraculous little gizmo called a Roku, and with the Roku and a wireless router, we can watch all the web-based TV we want. We were already paying for Netflix, which has more movies and TV shows than I could ever watch in this life time. And now we subscribe to Hulu-Plus, which allows us to watch just about all the recent broadcast stuff just about whenever we want. And we’ve got a digital antenna so if we need to tune in for live local news, no problem. 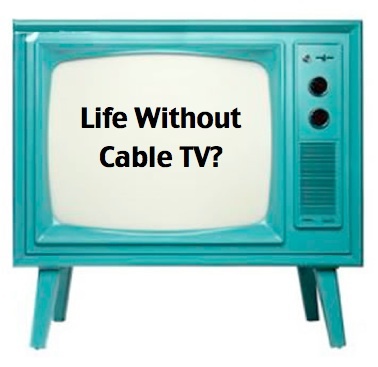 For someone like me who is really TV-philic and slightly techno-phobic, cutting the cable cord and embracing this new technology was a little bit scary. Mercifully, on this journey toward a cable-free existence, I’ve had a great sherpa in my adorable husband. He did the heavy lifting in researching our new set up and getting it up and running. And now it’s better living through fiber optics. In addition to being so much cheaper than cable, watching TV this way has made it a more mindful experience. Instead of there being (300 and) 57 channels and Nothin’ On, there’s now a self-selected menu of options that I’ve tailored to my own interests and tastes. Actually, most of the options are tailored to my son’s tastes, and when you go searching for dinosaur-themed programming on Netflix, you will find an embarrassment of riches. It’s been really lovely to settle in for the evening and actually take stock of my mood and my energy level and really think about what it is that I feel like watching. No more mindless channel surfing. And yes, sometimes I have to admit to myself that I don’t feel like watching anything and I actually turn the TV off. Wow. Memo received. In my fantasy life, I read more, and don’t need tv, but in reality I am not as brave as you! I really don’t watch that much tv, but it’s all cable when I do. Maybe I should explore the other options out there! Thanks for the memo! Roku really has been a little revolution for our household, I’d recommend it to everyone! And yeah, less TV and more books, or more hours in the day for more of both! So many people are getting rid of cable TV I almost feel bad for having it. Almost. But, I don’t think I want to live without True Blood and all of my favorite Bravo and TLC show so I don’t think I can!